4.) One year later, Sandy recovery still has a long way to go. In the year since Sandy, we have continually asked New Jerseyans about various aspects related to the event – everything from its aftermath to personal and state preparedness to believed connection to climate change to recovery and federal aid money to effects on summer vacation plans to the effectiveness of the “Stronger Than the Storm” ad campaign. What has been especially clear in all of this Sandy-related investigation is that New Jerseyans are still feeling the effects of the Superstorm in 2013, and even through the storm’s one-year anniversary, most do not think life in the state has returned to normal yet and do not think things will be normal again anytime soon. When last polled in November, just 12 percent of voters who think things are not normal are optimistic pre-Sandy conditions will return within another year; 61 percent say up to five years, and 13 percent think it will take up to a decade. Three percent see recovery taking more than a decade, and 6 percent say pre-Sandy normalcy will never return. This sentiment is reflected in November’s Sandy recovery ratings. On a scale of 1 to 10, with 1 meaning “not at all recovered” and 10 meaning “fully recovered,” voters score the state’s overall recovery at 6.1. Asked about specifics, ratings are lower. 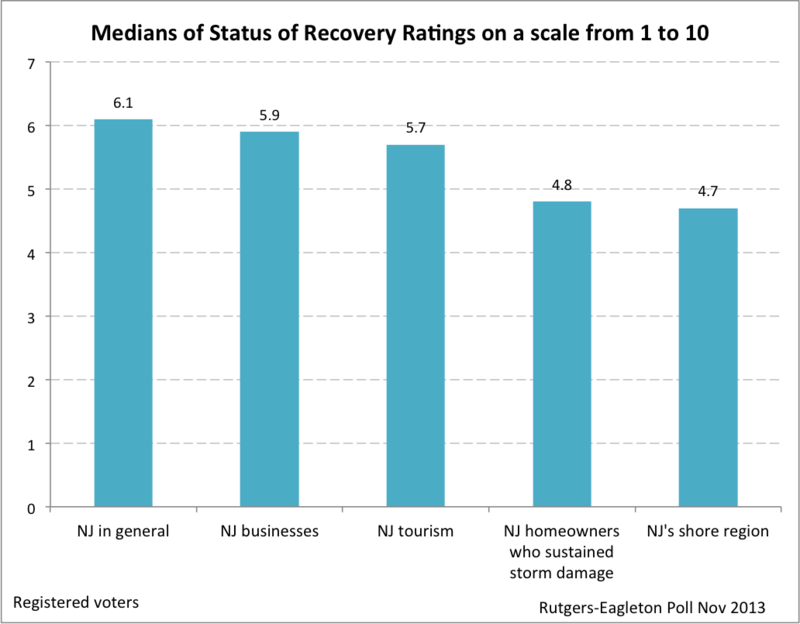 Recovery of the Shore region is rated at 4.7, while voters score recovery for homeowners with sustained damage, at 4.8. Assessments of tourism (5.7) and business (5.9) are somewhat more favorable. The clear message here is that even after an entire year focused on rebuilding post-Sandy, complete recovery is still far off.